This skillet chicken with black bean sauce is an easy weeknight dinner that doesn’t require any marinating time, so you don’t have to plan ahead. It’s delicious with a side of cilantro lime rice or cheese quesadillas! As much as I love baking sweet treats, one of my goals is to share more simple dinner recipes on the blog, too. I often don’t take time to photograph real meals, like this skillet chicken. But I know we could all use more easy dinner recipes, whether you’re a college student, working woman or man, stay-at-home-parent, or pretty much…anyone! • The chicken doesn’t need to be marinated, so you don’t have to plan too far in advance. You just prep the chicken and sprinkle fajita seasoning on both sides, then cook it in your skillet. 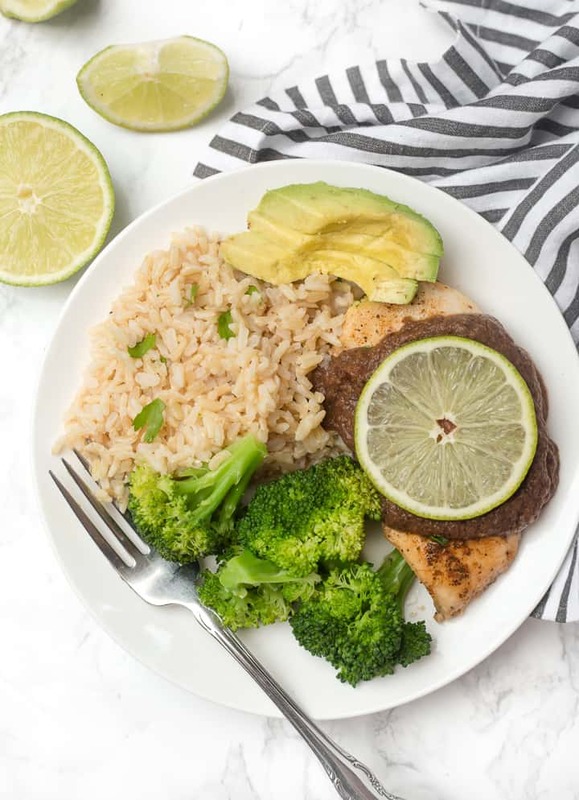 • You can serve it with guacamole or sliced avocado, plus shredded cheese, sour cream or plain Greek yogurt, and salsa, which are all of my favorite toppings! Chicken breasts can be tough– tough to cook to cook just right, and tough in texture sometimes, too. I don’t really enjoy cooking chicken because of the always-feared dry chicken breasts. But I have a few tips I’ve learned from my mom that help skillet chicken turn out really well! 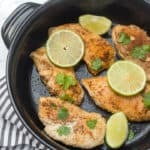 • Chicken breasts are often an uneven thickness, so you can pound each chicken breast with a meat mallet or other heavy object, like the bottom of a skillet. This helps make each breast an even thickness so one part doesn’t cook faster than the rest of the breast, resulting in tough, overcooked chicken. I just place each breast in a small plastic bag and pound each one to flatten it out. • Cook chicken breasts on medium-low in the skillet, and try not to let the pan get too hot. • Keep the lid on the pan to trap steam, which helps cook the inside of the chicken breast. • Let the chicken sit for 2-3 minutes before slicing it, if possible. Fortunately, even if you do end up with chicken that’s not quite as tender as you’d hoped, a good sauce does wonders for helping conceal that! Another reason I love this recipe is because the black bean sauce makes enough for two meals. You can freeze half of the sauce and the next time you make the chicken, the sauce is already done! You can just reheat the sauce in a small skillet or saucepan to serve with the chicken. The sauce comes together quickly in the blender. 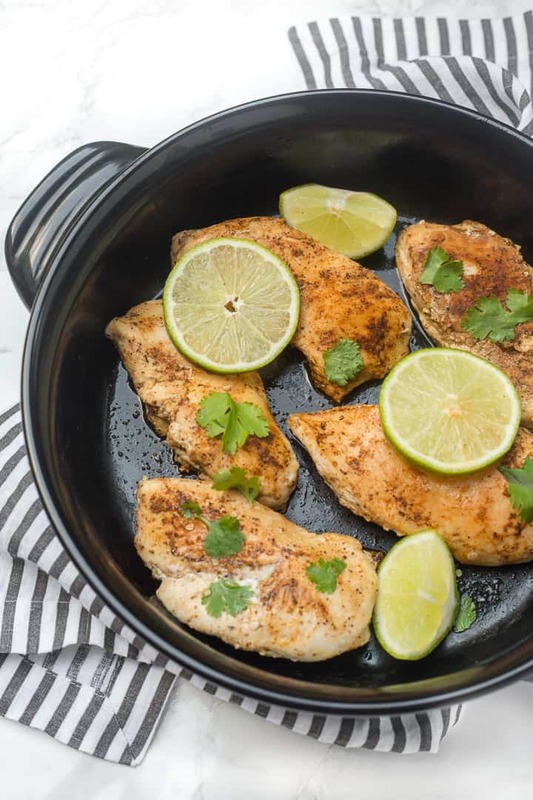 You saute onion and garlic together in the same skillet you’ll use to cook the chicken, then add it to the blender with black beans, a can of diced tomatoes & diced green chiles, fresh cilantro, lime juice, and spices. Blend it up, and that’s it! My family has been making this chicken with black bean sauce for over 10 years, if I had to guess. The recipe was originally from a Southern Living magazine, and then we’ve adapted it over time to make it our own. My mom would always serve this skillet chicken with a side of cheese quesadillas, which were a huge hit. She’d just cook the quesadillas in another pan alongside the chicken and cut them into small triangles, and we’d devour them as long as she kept making them. Cilantro lime rice is also a great side. I just cook brown rice with a pinch of salt and a small scoop of coconut oil. Once it’s done, I add a squeeze of fresh lime juice and a handful of chopped cilantro. 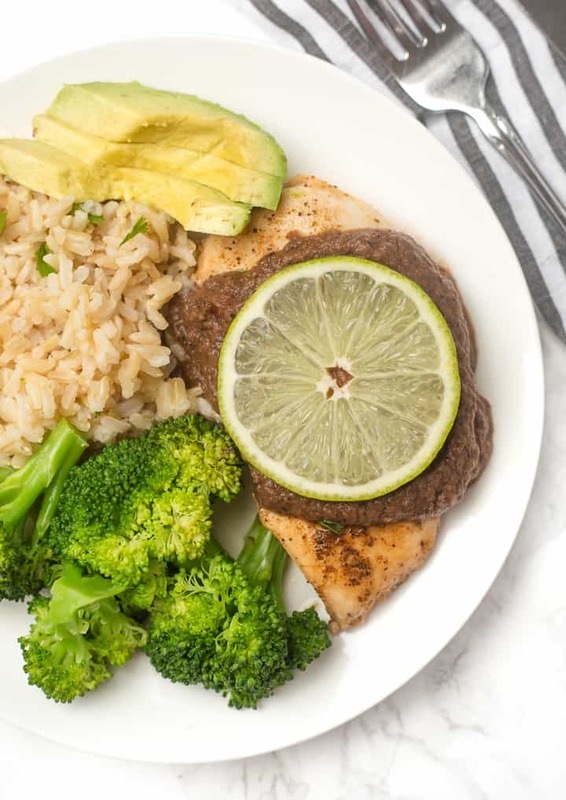 This chicken with black bean sauce is great with sliced avocado or guacamole, plus shredded cheese on top, or a slice of lime for pretty presentation. I hope you love this one and can add it to your dinner rotation, too! If you try this skillet chicken with black bean sauce, let me know in a comment or take a photo and tag me @livbane on Instagram! I’d love to see! In this recipe, I used my 10-inch short-handled Xtrema ceramic skillet, which I love because it’s all-natural, non-toxic, and nonreactive. Xtrema cookware is also oven-safe and gorgeous, and I love having it in my kitchen! This skillet chicken with black bean sauce is an easy weeknight dinner that doesn't require any marinating time, so you don't have to plan ahead. It's delicious with a side of cilantro lime rice or cheese quesadillas! Sauté onion and garlic in cooking oil under tender. Drain beans, reserving 1 Tbsp. liquid, and rinse beans. 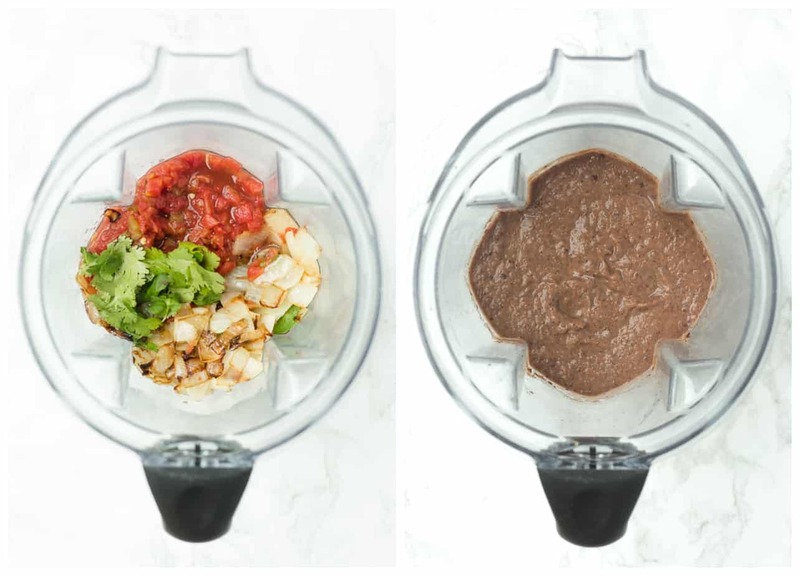 Add onion & garlic, beans with reserved liquid, tomatoes, cayenne pepper, cumin, cilantro, and lime juice to blender or food processor. Process until smooth. Pour mixture into a small saucepan and cook over medium-low heat, until heated through. Using a meat mallet or the bottom of a heavy skillet, pound breasts to an even thickness. Sprinkle with fajita seasoning. On medium-low heat, cook chicken in oil over medium-low heat for 4-5 minutes on each side, with lid on, or until chicken is done. Top chicken with black bean sauce and guacamole, salsa, shredded cheese, and sour cream or plain Greek yogurt. Serve with cilantro lime rice or cheese quesadillas. To make cilantro lime rice: Cook brown rice according to package direction, adding a pinch of salt and a small spoonful of coconut oil. Once the rice is done, add a squeeze of fresh lime juice and a handful of chopped cilantro. Chicken recipe sound great for this hot weather. Glad you added all the little details to prepare the chicken and rice.